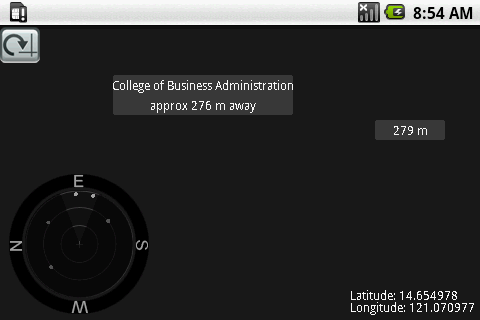 To determine the effectiveness of the application in helping the user find their way around the university. about 8-10 people from this category. use sites which do not come into the common know-how of regular students. We intend to test about 4-6 people from this category. second of how many sites a student can identify. And the other consists of how the students use the add point of interest function in the field. as they finish locating the site. different methods of identifying the sites. The number of sites pointed out correctly shall be noted. noted. The number of sites added shall be noted. One Feature of our application is to be able to add Points of Interest. The application should be able to detect long press on the Map and and get the coordinates of the location the user pressed. I tried implementing OnTouchEvent on our overlay which should detect an action down when the user pressed on the screen and a timer for the delay but it seems to overlap on our overlay’s tap listener which lead to failure in detecting Taps. But using OpenStreetMapViewer‘s own overlay method onLongPress seems to work. I just added an interface Listener for Long Press. Our application can now detect a long press and add Coordinates on our database. All Poi’s added by the user are called “Sample Building” though. Still need to work on that.. Maybe I can use a separate activity holding textboxes with a Dialog theme for the interface. I added a radar that shows the user nearby points of interests within a range of 300km. It also shows the POI’s positions in relation to the user. As for the marker position on the screen, I still have to calculate this based on the altitude and pitch values. I added a simple compass that I think will be helpful in our AR preview. No changes in our previous code though. I still have to consider changes in the roll and pitch values. Just updated our code for our camera mode. Our application can now identify POI’s within a 500 m radius. It will position our markers depending on the POI’s angle with the current Bearing. I just need to port this into an actual device to see if the markers match the building in the camera preview. By the way, the camera preview is turned off in the preview above cause the moving checkered board annoys me. started on the Augmented Reality View..
Doesn’t look so bad but the embedded labels on OpenStreetMap’s tiles are rotating along with the map image making things a little messy. 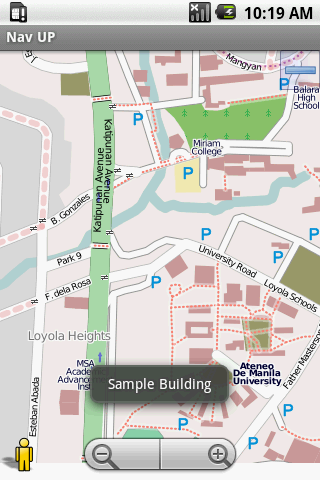 We might as well contribute some Geographic information on OpenStreetMap about buildings and labels on our Campus. We’ll just polish things first on our external Provider. At least the workaround might be helpful to anyone planning to make their own rotating map using custom tiles.